BLOOD MANOR, NYC's Premier Haunted Attraction: The Nightmare on 27th Street, returns with a depraved appetite for gore and a twisted thirst for blood, in the same creepy location, 542 West 27th Street (btwn 10th & 11th Ave). With louder screams, scarier dreams and more thrills for each moment in its fun-filled darkness, BLOOD MANOR makes your nightmares come to life. 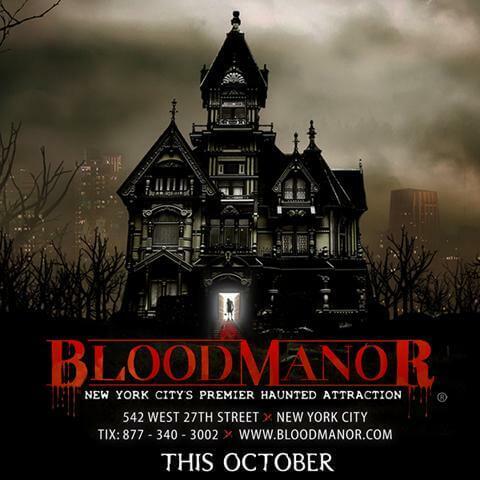 BLOOD MANOR - NYC'S Premier Haunted Attraction is a haunted labyrinth of of dark corridors, mazes and 15 chambers of terror! Throughout your journey creatures appear, scream and cackle as the sounds of the dead envelope your senses. Will you escape Cannibal's Kitchen or the Iron Maiden? Can anyone survive THE SLAUGHTERHOUSE!! BLOOD MANOR is meant to be intense and scary and is not recommended for those under the age of 14. 212-290-2825 and $35 at the door. NEW FOR 2016! FLEXIBLE TIMED ENTRY AND OPEN R.I.P. ENTRY TICKETS! BASED ON CUSTOMER REQUESTS, WE HAVE REDESIGNED OUR TIMED TICKET ENTRY SYSTEM TO MAKE YOUR VISIT TO BLOOD MANOR AN EVEN BETTER EXPERIENCE!. Please visit www.bloodmanor.com/tickets for all ticket pricing. NEW FOR 2016! FLEXIBLE TIMED ENTRY AND OPEN R.I.P. ENTRY TICKETS! BASED ON CUSTOMER REQUESTS, WE HAVE REDESIGNED OUR TIMED TICKET ENTRY SYSTEM TO MAKE YOUR VISIT TO BLOOD MANOR AN EVEN BETTER EXPERIENCE!. Please visit www.bloodmanor.com/tickets for all ticket pricing. I love horror because they're really fun. They tap into those wonderful primal emotions. The haunted house is really awesome. It's very surprising. I love to read scary movies. Scariest thing you will experience next to sleeping paralysis. This will take the soul out of you if you aren't hard hearted or experienced horror movies. Not recommended for casual entertainment. Blood Manor is an awesome haunted house attraction. It is definitely terrifying right when you walk through the door. Many scary monsters jump right at you out of nowhere!!! It is very surprising. You guys should go there. I am 13. I could handle the scare.? ?